Family friendly beach house with all the comforts of home. The beautiful sandy beaches are in your back yard! It is newly renovated and newly furnished. The downstairs bedroom features a queen bed as well as a spacious closet! Upstairs to the right is the guest room, with two twin beds, featuring a spacious closet, and a personal full bathroom. The Third room the master suite is beautifully decorated. The thought of having your morning coffee in bed overlooking the beautiful emerald coast. 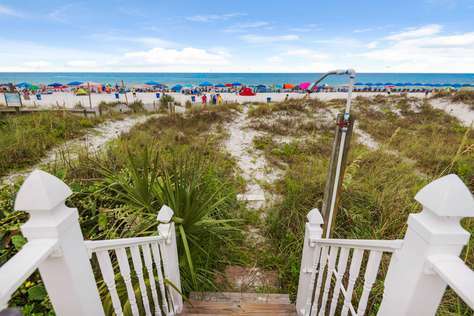 It includes a full access bathroom, spacious closet and an even better view of the gulf! The downstairs living area is a magnificent sight, Watch the breathtaking sun go down all while sitting on the couch. The downstairs flatscreen TV has full cable access to keep up with all your movies and shows. Full area dining, seating for six and 3 barstools. As well as a fully equipped kitchen for all those home cooked meals! I promise you the memories you will be making will last a lifetime! Book with Beachy-Cations today! The popular beaches of Panama City Beach are calling. Stay near the shoreline of the Gulf of Mexico in one of Beachy-Cations rentals at Beachwalk Condominiums. Each of these two-story townhomes comes with a fully-equipped kitchen, a dining area and a spacious living room, allowing you to enjoy the comforts of your own home while you are away on vacation. Craft a delicious meal in your vacation rental or visit one of the many incredible restaurants lining the streets of Panama City Beach. Unwind on your private patio and breathe in the salty air while exchanging stories with your friends or family Everyone is welcome of course! but, the responsible party booking this reservation must be 25 years of age or older and remain present throughout the entire stay. This wonderful two bedroom, two bathroom condo is located in the popular Beachwalk Resort & Community. Beachwalk is an updated, peaceful, and family friendly development found just west of Highway 79, very close to Pier Park! 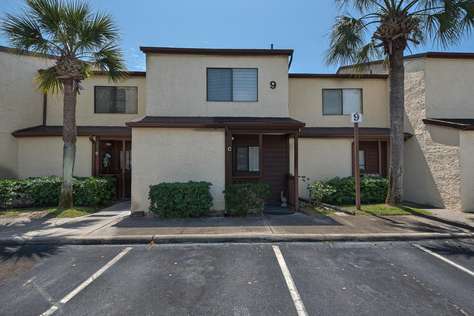 Not only is this property's location close to all you'll want to see and do in Panama City Beach, but it is less than a five minute stroll to have your toes in those beautiful white sandy beaches! You deserve a break, and there’s no better place to unwind and rejuvenate than a Panama City Beach vacation rental at Beachwalk Condominiums. With a King in the master bedroom, two twins in the second bedroom and sleeper sofa in the living room. Beachwalk Bungalow Condominiums #9C is an incredible choice for a vacation with a group of close friends or family. When you are not dining on fresh seafood and other tasty treats at one of the popular restaurants in Panama City Beach, create a delicious meal in your fully-equipped kitchen. This vacation rental also features an open dining area and a cozy living room, providing great hang-out spots for you and your loved ones. The private, covered patio will easily become one of your favorite places to relax and enjoy the peaceful beach atmosphere of the Beachwalk condominiums. Start each day sipping your favorite morning beverage while breathing in the salty air. The living room, half bath, dining area and kitchen are all located on the first floor of the home. The two bedrooms and full Bath can be found on the second floor. Don't miss out!